Auto industry experts predict that more than 50 percent of cars on the road by 2020 will use a relatively new type of fuel-efficient engine. This transition, however, has raised questions about its ultimate effect on the climate. A study published in ACS’ journal Environmental Science & Technology has found that because the newer engines emit higher levels of the climate-warming pollutant black carbon than traditional engines, their impact on the climate is uncertain. Naomi Zimmerman and colleagues analyzed four scenarios based on reported black carbon emissions from both traditional port fuel injection engines and newer gasoline direct injection (GDI) engines. They determined that installing efficient particulate filters in vehicles with GDI engines — even if they slightly lower fuel efficiency — could likely balance this trade-off and benefit the climate. 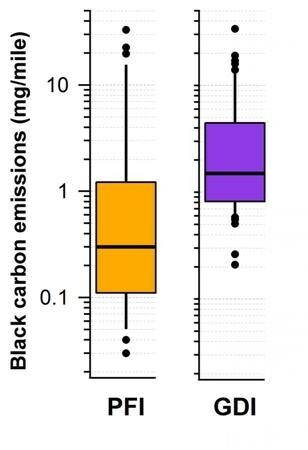 But this outcome is not a given and depends on a variety of factors that can impact black carbon emissions such as engine design, fuel composition and geographic location. The authors acknowledge funding from the Canada Foundation for Innovation and the Natural Sciences and Engineering Research Council.